ab25024 recognises mouse Mouse Ly-6G. Our Abpromise guarantee covers the use of ab25024 in the following tested applications. Ly6G is a GPI-anchored protein, that is also known as the myeloid differentiation antigen Gr1. 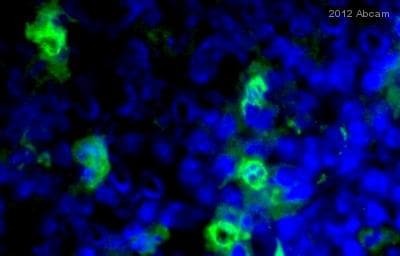 The antigen is transiently expressed on monocytes in the bone marrow. The level of antigen expression in the bone marrow directly correlates with granulocyte differentiation and maturation. Ly6G is expressed predominantly on neutrophils, also in a subset of eosinophils, differentiating pre-monocytes, and plasmacytoid dendritic cells. Attached to the membrane by a GPI-anchor. 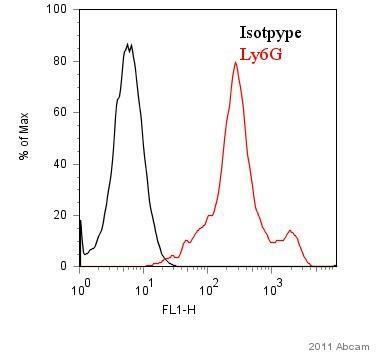 Flow Cytometry analysis of C57Bl/6 bone marrow cells labeling Ly6g with ab25024 0.5µg (right panel), Rat IgG2b (FITC) isotype control at 0.5µg (left panel). BALB/c bone marrow cells were stained with either rat IgG2b-FITC (as an isotype control) or rat anti-mouse Ly-6G-FITC (ab25024) at a concentration of 1ug/106 cells. Large cells were then gated and analyzed on a flow cytometer. 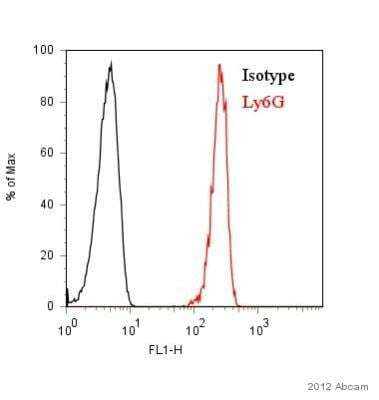 Flow Cytometry analysis of C57Bl/6 bone marrow cells labeling Ly6g with ab25024 at 0.5µg. 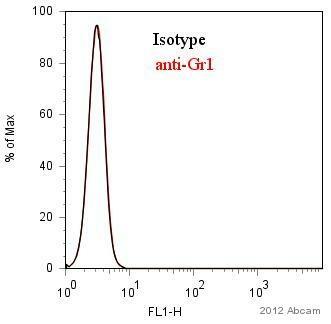 Flow Cytometry - Anti-Ly6g antibody [RB6-8C5] (FITC) (ab25024)Image courtesy of an anonymous Abreview. ab25024 at a 1/100 dilution detecting Ly6g in LPS activated human monocytes by Flow Cytometry.Gating strategy was for alive cells. 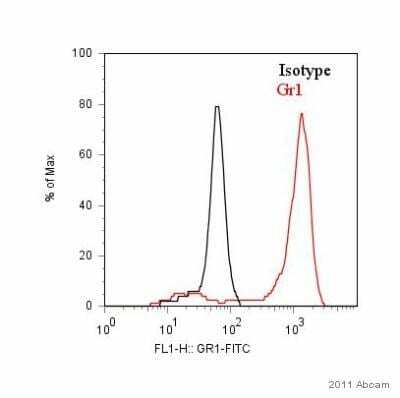 ab25024 at a 1/100 dilution detecting Ly6g (Gr1) in murine blood cells by Flow Cytometry. Gating strategy was for monocytes. 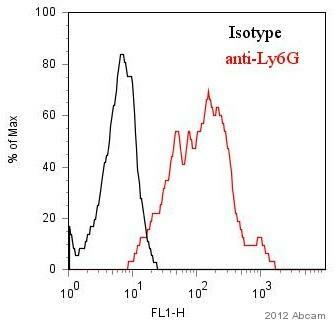 ab25024 staining Ly6g in Cynomolgus Monkey whole blood by Flow Cytometry. Red blood cells were lysed in PBS + 1% BSA and 0.01% sodium azide and fixed in paraformaldehyde. The sample was incubated with the primary antibody (1/10 in PBS + 1% BSA and 0.01% sodium azide) for 1 hour at 4°C. Publishing research using ab25024? Please let us know so that we can cite the reference in this datasheet.